Hi Ted and thanks for your kind comments! 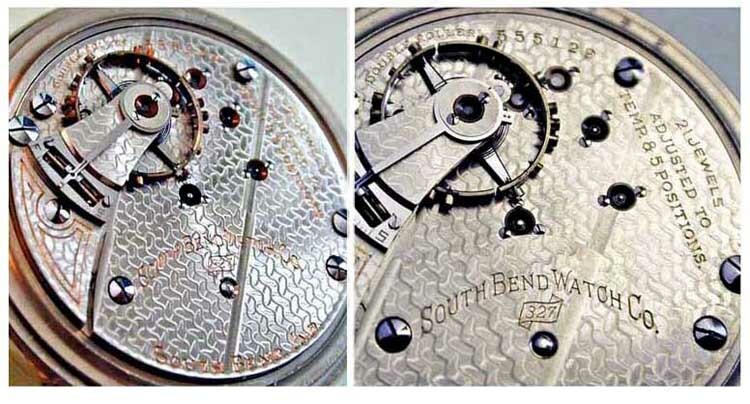 South-Bend's Grade 327 is that "other" model of 21-Jewel 18-size movement. It has long been held that only 300 numbers were blocked, there may be more. But this we know for certain, the Grade 327 was made briefly and dropped from their lineup, possibly to put added emphasis on "The Studebaker" or simply because of confusion and slow sales. But a few years later their 16-size Grade 227 was a big hit as South-Bend watches go, some 45,000 of those were produced over a twenty year time-frame. You asked for a picture, well I must tell you, the South-Bend 327 could be the all time most difficult to photograph movement. If you get the lettering the damaskeening is obscured and if you get the damaskeening the lettering disappears! So here goes with a merge of two images, neither of them all that great. Lindell, Thank you for the answer an the pics of your 327.I for some reason always assumed the damaskeening would be the same as on grade 227.That one has a pattern all its own....You must have a pretty complete South Bend collection if you have a 327.Must have been a hard one to track down!Thanks again, Ted.